The number of convictions for "extremist expression" in Russia is growing significantly. (с) Vladimir Trefilov / RIA Novosti. All rights reserved.Television remains the main source of information on politics in Russia, but the number of people who get news online grows by the year. Indeed, it’s online that Russia’s independent public discourse and opposition campaigning, as well as, of course, radical campaigning, takes place. This makes the Russian government uncomfortable — and discomfort inevitably results in crackdowns. Being too broad and vague, Russia’s anti-extremism legislation is ideally suited for punitive measures and its targets can change depending on the political situation and attitudes in society. As part of its work monitoring radicalism in Russia, the Sova analytical centre has just published a report analysing the Russian state’s fight against “extremism” on the Runet over the last two years. The state’s most important measures against “extremist speech” online are criminal proceedings. In 2015, out of 232 convictions over extremist speech that we know of, 194 concerned online speech — about 84%. In 2014, it was no less than 138 out of 165 convictions (the same 84% of the total). And the guilty verdicts are growing annually. This tendency is especially picking up online. The main reason for this trend is that Russia’s law enforcement agencies are obviously reorienting toward pursuing those cases that can easily be discovered and prosecuted. The data for the first half of 2016 supports this: of 102 convictions handed down for “extremist expressions”, 92 dealt with online expression — that’s 90%. Since 2010, most proceedings against Russia’s extremists concern their social media activity. By 2015, the number of convicted social media users was twice as big as in 2010. Most of them are users of VKontakte, Russia’s most popular social media network, which is especially beloved by younger citizens, including radical youth. VKontakte users are easy to track — they have to add contact information and phone numbers when they register. 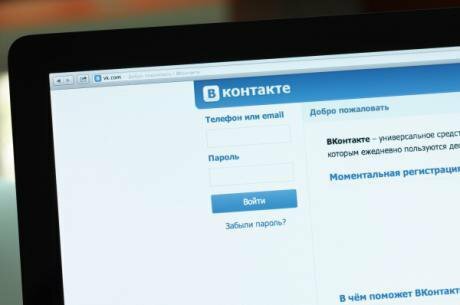 VKontakte administrators hand over personal data to law enforcement as soon as they’re requested to do so, while foreign administers (at Facebook and Twitter, for example), will actually analyse police requests, and can even deny them. 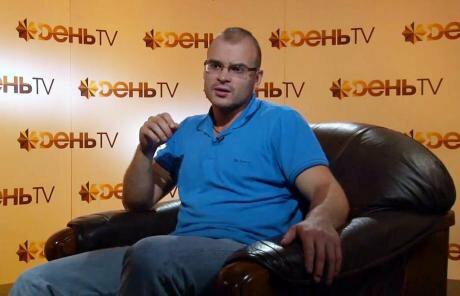 Maxim "Tesak" Martsinkevich, a far-right activist, was sentenced in August 2014 to five years in prison (later reduced to 2 years, 10 months). (c) Maxim Blinov / RIA Novosti. All rights reserved.Traditionally, criminal proceedings are launched against random, unknown VKontakte users and local radical activists. But in 2014 and 2015, the campaign against social media users grew more “politicised” — convictions were handed down to far-right nationalist activists such as St. Petersburg’s Dmitry “Besheny” Yevtushenko, Nikolai Bondarik, and Maxim Kalinichenko, as well as Moscow’s Maxim “Tesak” Martsinkevich and Vitaly Shishkin, plus others. But the evidence, and how the materials used by the prosecution were chosen, are doubtful in some of the cases. It is possible that the principle of “let’s get them on the first thing we find” is at work. For example, in August 2014, when Maxim Martsinkevich was convicted of posting three videos, they certainly fell under criminal activity, while the popularity of Tesak’s videos carried an obvious public threat. But it’s still uncertain why the least demonstrably criminal videos were chosen. Martsinkevich, for example, has other videos, featuring cruel torture of people, but the violence in them takes place under homophobic slogans. A number of cases involve abuse of anti-extremist legislation. It’s hard to tell where the boundary between something objectionable (but legal) and something outright criminal lies. When we consider cases where the courts clearly ignored the literal meaning of legislation, we realise that at least nine people were wrongly convicted for online posts in 2015. In 2014, there were two such convictions. The problem is not just with these cases, which aren’t that frequent. The problem also has to do with the unthinkable (by European standards) amount of people convicted of hate speech, even real hate speech involving racist epithets or jihadism. The main reason for launching a criminal case has to do with the level of danger to the public. This has concerns not just the text itself, but who and how many read it. Potential readers don’t matter — real readers do. This is especially important for online speech — potentially everything that isn’t password-protected can be read by all of humankind. But the police and the courts don’t see it that way. Since 2011, the percentage of convictions for multimedia (video, audio, illustrations and photos) has risen considerably. But the videos themselves are often not deemed criminal — only reposting. Those who are convicted over them usually did not create the videos, nor were they the first to post them. Until recently, sentences for online speech were, by Russian standards, not very harsh — usually community service or fines. But in 2015, both the number and percentage of people sentenced to real time behind bars grew significantly. 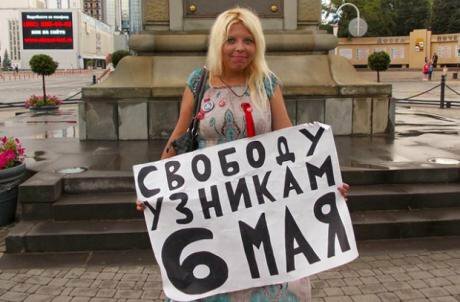 In August 2014, Darya Polyudova was sentenced to two years in prison on extremism charges for posting pictures of her activism online. Source: personal page on VKontakte.A percentage of these sentences were handed down for multiple criminal convictions (race-related violence, weapons possession, theft, etc.). Some were sent to prison for violating parole, or else were in prison already. Some were convicted of “extremist speech” for the second time, which seriously increases risk of incarceration — in 2015, there were five of these people, in 2014, one person had a second conviction. But in 2015, at least 16 people were imprisoned for “extremist expressions” alone. Sixteen such sentences is an unprecedented increase for Sova centre analysts. In 2014, harsh sentences were handed down three times. In 2012 and 2013 – one time. In 2011, though, there were four sentences against a total of six people. Most of those imprisoned spoke against the government and the president of the Russian Federation, against Russia’s military involvement in Ukraine, or for armed jihad. At least five were sentenced for calls for xenophobic violence. Based on what we know, nine cases involved calls for violence, two had nothing to do with violence (these are the famous cases against Darya Polyudova and Raphis Kashapov), and five cases we have no information on. In total, 14 out of 16 verdicts cannot be called unlawful, but time behind bars is still a very harsh sentence. In almost all of these cases, the principle of the punishment fitting the crime and the balance between restriction and free speech were violated. Besides criminal proceedings, Russia’s administrative code is also widely used. In 2015, we know of at least 81 administrative convictions for “the propaganda and public display of Nazi paraphernalia and symbols” handed down for online posts. In 2014, we know of 42 such cases. In 2015, there were 24 unlawful convictions. In 2014 – just three. The police and the courts take virtually no notice of context in these cases. Often, people convicted over swastikas were using it in a historic context or as a polemic device against an opponent. In 2012, the clip "Last interview of the Primorye partisans" was declared extremist in court and registered on Russia's list of banned materials. Source: YouTube.There have been some outright ridiculous cases. In 2015, a Chelyabinsk resident was convicted over a VKontakte post featuring a still from the movie Iron Sky – a sci fi comedy about Earth doing battle with Nazis who took refuge on the moon following the Second World War. In 2014, there were 70 administrative convictions for “mass propagation of extremist materials and/or their production or possession with intent of mass propagation.” In 2014, there were 43. At least 14 such convictions were unlawful in 2015, and nine in 2014. A harmless Disney film somehow wound up on the federal list of extremist materials in 2013 — and was finally removed in 2016. We also know of a completely absurd case from Siberia’s Tomsk region, where two people were fined for posting a classic anti-fascist Donald Duck cartoon “Der Fuhrer’s Face” from 1942. This harmless Disney film somehow wound up on the federal list of extremist materials in 2013 — and was finally removed in 2016. There have been no convictions over social media “likes,” although we do know of a conviction over a social media tag. In September 2014, Perm resident Yevgeniya Vychigina was fined for being tagged in a repost of a banned video called “The last interview of the Primorye guerrillas”, which details the final address of the group behind a 2010 killing spree in Russia’s Far East. Some “friend” of Vychigan’s on VKontakte tagged her and 30 others when he posted the video, and Vychigna confirmed the tag. Convicting this user for “propagation of extremist materials” makes little sense. Tagging people on photos and videos to get their attention is common social media practice — there is nothing odd about Vychigina confirming the tag without even seeing the video. This was the first and, so far, only “extremism” case over tags. But should others follow the Perm example, we may see yet more arbitrary convictions. Russia’s administrative code is also actively used in the campaign to filter content in schools, libraries, internet cafes, post offices and other organisations which provide people with internet access. In 2015, at least 17 individuals and organisations were fined for not blocking “extremist” content. In 2014, there were six such convictions. The people who were fined were owners of computer clubs, shopping malls, cafes, a railway station restaurant, a library director and several school administrators. In 2015, the owner of a bakery in Penza region was fined for providing WiFi access with no content filtration, therefore, the prosecutor argued, “children visiting the bakery could use access WiFi via telephone” and could therefore gain access to banned informations. Over the last three years, the main targets of the war with extremism online were internet service providers — who first and foremost must block access to “extreme” content. 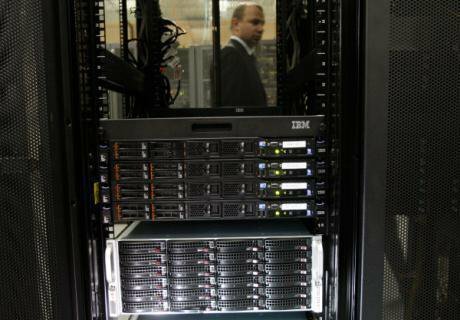 Russia has maintained a unified registry of banned websites since November 2012. At first, Russia’s consumer watchdog Roskomnadzor included websites on the registry if they were judged extremist in court. But in 2014, courts began blocking websites based not on extremism, but whether they provided content similar to already banned content (we’re talking about virtually the same content, usually). According to the Roskomsvoboda site, by June 2016, there were at least 566 “extremist items” on the register. Based on available data (only Roskomnadzor has access to the full data), 283 sites wound up on the register via court order in 2015. In 2014, 139. In 2014, 20 items placed on the register were doubtful or even outright unlawful. In 2015, 72 such items were placed. Roskomnadzor has a separate registry for working via this mechanism. In 2015, 133 websites were listed there, 166 websites were listed in 2014 (these numbers don’t take into account mirror sites, as well as sites that were unblocked after undesirable content was removed). In 2014, there was doubt of outright illegality in about 53 cases on the so-called “Lugovoi registry,” most of which were opposition sites and sites featuring announcements of dissident activity. In 2015, around 25 pages were blocked unlawfully. Although the banned sites registries are formally separated, procedurally speaking, they’re treated the same. Roskomnadzor blocks a URL or a subdomain or even an IP address, which means that many absolutely harmless sites are blocked simply for being on the same server. In the last two years, the unified registry has become just another hamfisted mechanism for the Russian state. Websites with calls for violence by skinheads and jihadists are interspersed with peaceful Muslim sites and other harmless resources, while URLs with radical statements from Ukraine are similarly interspersed with perfectly decent articles by Ukrainian media outlets. The “Lugovoi registry” features even more ridiculousness and arbitrariness. In most cases, immediate blocking of materials (such as Islamic texts) that have existed online for many years makes no sense. The registry features longtime bans over texts with dates for planned protests that have long since passed. That’s beside the fact that these bans are against the law on freedom of assembly and free speech. The “Lugovoi law” was passed right after violence in the Moscow neighbourhood of Biryulyovo in October 2013, and was justified by a need to quickly stop the mobilisation of people with potential for mass unrest. But it is obvious that stopping mass unrest by blocking information access is impossible — people use too many channels for communication. And anyway, many pages that are similar or even identical to banned websites remain unblocked. The battle against online extremism has intensified — there are more criminal and administrative convictions than ever before. More and more websites are banned or forced to remove content. But the quality of the legal proceedings is clearly degrading. There is more and more pressure on social media users. Sentences are generally growing harsher. Why is this happening? Besides the obvious political goals, “bureaucratic inertia” in law enforcement remains a problem. The Russian state’s online anti-extremism warriors are more interested in social media reposts and constant and often meaningless demands to block not very dangerous or even absolutely harmless materials. More serious issues, such as the prevention of racist violence, are neglected. Furthermore, measures against “extremist speech” of all kind appear random, while many serious cases simply go unnoticed. In other words, on paper, the statistics in the fight against extremists look good. But in reality, this battle is not making society safer — it only further limits free speech.